Thanks to huge facilities and a longstanding tradition of fitness, Texas A&M students stay active. On the College Life page in the April issue of M&F (available on newsstands now) we spotlight the third largest college in the nation, Texas A&M University. We’re going to give you a closer look at the college campus whose recreational facilities provide a way for anyone to be fit. At an enrollment of 58,000+ students, Texas A&M embodies the saying “Everything is bigger in Texas.” The senior military college boasts a Student Recreation Center, which after renovations will be 480,000 square feet in 2016. Within it, the strength and conditioning space will expand to 37,000 square feet, complete with more than 100 smart cardio machines, a full personal training suite, and an indoor turf area for plyometrics, TRX, battle ropes, and other functional training tools. Overall, the Aggies tend to favor expansion. But wait there are more expansions. Texas A&M is adding three more fitness studios to make their total number of fitness classes offered more than 108. The university is also adding a new eight-lane pool in 2016. With 20 NCAA Division I-A varsity sports and nearly 2,500 Corps of Cadets members, an important selling point for Texas A&M is that the campus facilities are offered to everyone. There’s indoor soccer, volleyball, and badminton courts and an indoor rock climbing wall with nine top routes. 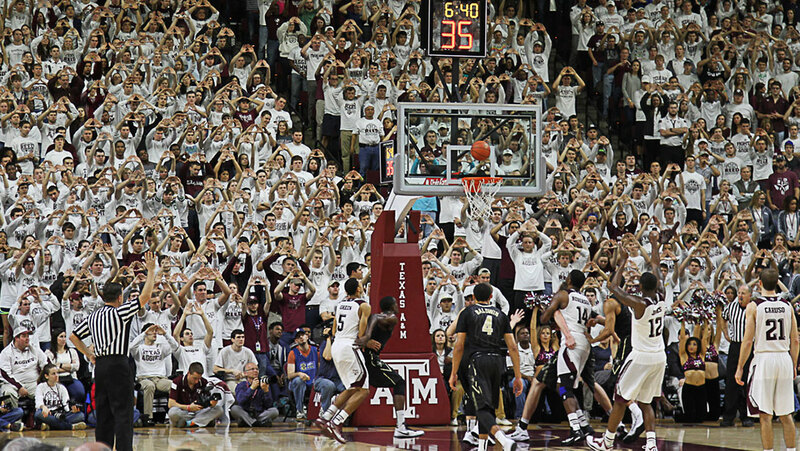 The Aggies love their recreational sports too. In terms of campus community involvement and outreach, Texas A&M offers a Healthy Living Lecture Series each semester, a program designed to educate students about a variety of health and wellness topics. Whether you’re one a Cadet, varsity athlete or weekend warrior, Texas A&M has something for you to have fun while breaking a sweat.